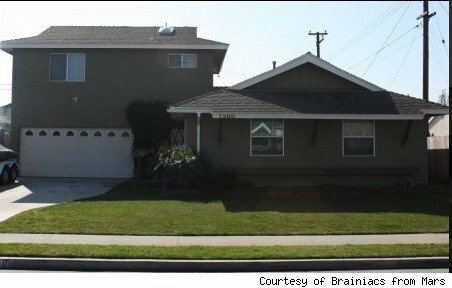 Scott Hostetler didn’t bother to tell his family that he’d applied online to have their house in Buena Park, Calif., turned into an advertising billboard for the price of their monthly mortgage payment. He figured that it was like taking a chance on the lottery — and who ever expects to win the lottery? Then, about three weeks ago, he got the call from Romeo Mendoza, head of the advertising company that made the offer, Brainiacs From Mars. Mendoza delivered the shocking news: The Hostetlers’ home had been selected out of some 38,000 applications to be the first to be branded with a very special custom paint job, a deal that would cover the monthly mortgage payment of $2,000 for at least three months and perhaps up to a year — depending on when either the homeowners or the ad company wants to end the contract. At the end of that time, the company promised to restore the home’s exterior to its original appearance. Until then, though, it would display the bright orange and green colors of Brainiacs From Mars (formerly known as Adzookie). The company signage in the photo above is just temporary; while Buena Park is OK with the paint job, city zoning laws prohibit permanent advertising signs on residences. Hostetler and his wife, both of whom are deaf, have lived in the home for about 18 years. They both work for Goodwill Industries — he’s an information technology manager and she’s a rehabilitation counselor. Their 17-year-old daughter (pictured with her parents) lives at home; they also have a son who is a freshman at Rochester Institute of Technology in New York. The Hostetlers say that they plan to use the extra money sent directly to them monthly from Brainiacs to pay down some bills, replace Scott’s old Chevrolet Suburban, and maybe go on vacation. The idea for the Billboard House came to Mendoza, the company’s chief executive, as he picked up his 7-year-old from school. Every day they would pass a sign that advertised a bank-owned property. And when he visited his mother in Las Vegas, there were areas so hard hit by the housing crisis that, he says, they seemed to him like ghost towns. Government can only do so much, he says, while corporations have the money, and this seemed to him like a promising way to get some of that into the hands of people who needed it the most. While Mendoza figures that about 10 percent of those who applied to have homes turned into billboards “wanted to have a good time” with it and were attracted to the novelty, he insists that “we’re here to help the homeowners.” Applications “have come from literally everywhere,” he says, though he has noticed a higher amount from the “foreclosure states” — Florida, Nevada, and California. Applications have also come from Japan, Spain, Russia, the Czech Republic and many other countries. 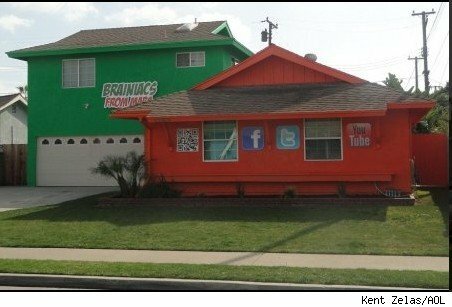 One city councilman reportedly invited Brainiacs From Mars to paint an entire row of homes in his town. The advertising company has plans for 100 such homes, Mendoza says, but a goal of 1,000 if they can attract the advertisers. In areas like Buena Park that prohibit advertising signage, they’ll stick to the brand’s colors, but where community zoning allows more, signs would go on the homes. While there is no set of particular qualities that Brainiacs is looking for in a homeowner, Mendoza says the Hostetlers are the kind of close-knit family that “felt right” to help debut the promotion. As for official requirements, the applicants must own the home, and local zoning laws must allow the paint job. Selected homeowners also have to be prepared for neighbors’ reactions. You might think the company would be looking for homes in high-traffic areas, but the Hostetlers’ 1960s house is inside a quiet development of tract houses, at least a block away from main streets and within view of a neighborhood park. You might get a glimpse of the back of the home from nearby Knott’s Berry Farm, though, as you prepare to plunge from the top of its Xcelerator or another towering thrill ride. The house is practically in the shadow of the amusement park, one of Southern California’s top tourist attractions, whose roller coasters serve as a backdrop for the neighborhood. After its official unveiling today, the house could become its own neighborhood attraction — along the lines of a elaborate Christmas display, the Hostetlers say. While AOL Real Estate was there on Sunday, members of a motorcycle club that was gathered at a house across the street were taking pictures, and a quartet of teens on skateboards stopped to take a look. Vivian Largent, who lives across the street and a few doors down, says that she thinks the new paint is fine as long as it’s temporary. She would have some concerns about property values if it stayed up for the long term, though. She also wondered why the advertising sign that the roofers has posted in her front yard, as they’d worked on her home, was allowed, while the signage that Brainiacs From Mars attached to the Hostetlers house for media photographs had to be taken down. Correction: An earlier version of this story incorrectly identified the college that Scott and Elizabeth Hotstetlers’ son attends. Find vacation homes for rent. Find vacation homes for sale.